On a construction site, documentation and communication are key. Keeping tabs on the who, when, where, why, and what is happening on a project is crucial to prevent a project derailing and going off schedule. Daily (or at least weekly) reports are needed to know just what is going on. But you may already know that. So let’s take a bit of a closer look at daily reporting – why it’s so vital, what are the essential items that it needs to contain, and how to go about completing them. Why do I need a construction daily report? Although the answer to this question may seem a little obvious – so we have documentation of what’s going on with the jobsite! – there’s a little bit more to it than that. Although many consider the reports to be tedious, and think that they should be kept short and sweet (due to lack of time and busy schedules, or due to the fact that rearranging and resizing pictures in MS Word to make it look pretty is a boring thing), here are the reasons why keeping good (and definitive!) construction daily reports are necessary for completing projects and reducing the overall project cost and timeframe. By disseminating daily reports to all important jobsite stakeholders, they can easily pick any one up, or follow across the week to see what is happening onsite – even if they aren’t required to be present just yet. Because daily reports are a micro-snapshot of site progress, you can pin down the exact day when things happen. This is important for risk mitigation of issues, to quickly implement a workable timeline. Contractor said that it’s not their fault that the work is behind schedule? Well, you can easily trace back within daily site reports to see if that’s true. 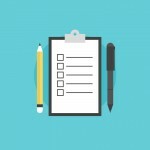 Check if assignees have started work on issues they’ve been assigned to within the report easily. Often you also need to prove that you did inform certain people about certain issues or observations on time. 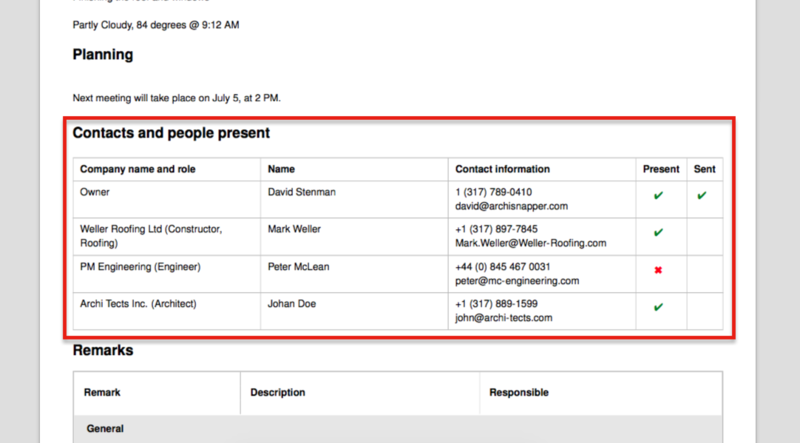 Having a jobsite report PDF in your mailboxes “sent items” is clear evidence that you did inform the right people at the right moment about certain issues or observations. And this is not just the big issues, e.g. 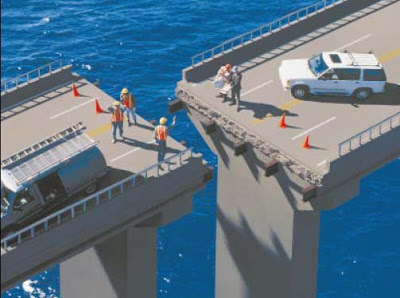 we need to rethink the floor plan because site digging didn’t go as planned. An accidentally skipped electrical outlet, late start of task due to two days’ bad weather, and the wrong length of overhead beams arrive on site, all goes into the report. What are the necessary elements in a daily construction report? This section will include the project name and description, the project code or number used internally, and the address of the jobsite. These will be important to keep your records in order, no matter how many different projects you have going. This will be the code or number to refer to this exact report if necessary, along with today’s date. The report number is often a combination of the unique project ID + 1, 2, 3, … and so on. 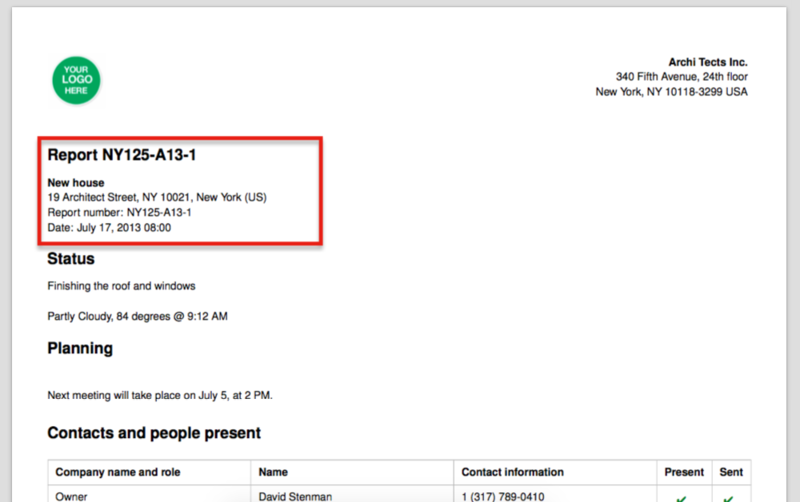 In this case, the report number is “NY125-A13-1”, which is the first report for project “NY125-A13”. Although it may be easy enough to just identify a report by the date, many systems also require a number or code for the exact daily report. 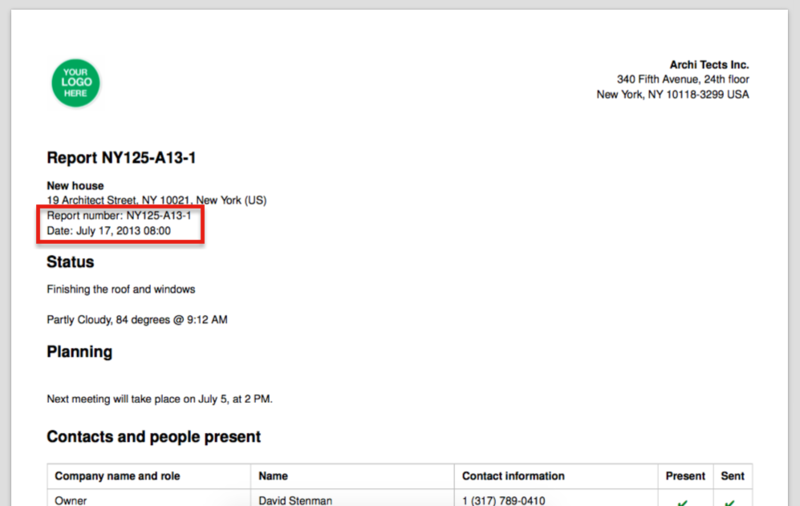 This makes finding and referring to the report later a lot easier (“as you can read in report number NY125-A13-1”), no matter how many daily reports you end up accumulating. This section often includes the weather conditions and the time onsite, as well as the overall project progress and optionally some generic site overview pictures, or a view on the planning. It is always good to keep track of weather conditions, as they influence construction project plannings sometimes a lot as one can imagine. This list will encapsulate all the important people involved in the project, such as the electrical engineer, the project manager, and the landscape architect. For each contact, list their name, position, company they work for, contact details, whether they were present on site that day, and whether they were sent a copy of the report. Ensuring everyone involved in the project is in the loop with daily reports is essential. When stakeholders are assigned to tasks arising from observations, they are able to quickly scan each daily report for their names. This is the heart of the report. Various different companies record their observations in different ways. It is standard procedure to note down (for each project component that was worked on across the day, or issues that arise) the task name and a unique reference number or code, the task due date, complete or incomplete (and possibly the percentage of the task complete), the parties involved / assignees, a description of the work done and/or any outstanding issues arising, and pictures and/or plans of the task relevant to the description. Make sure to check out our article The Importance of Construction Jobsite Photo Documentation to learn about taking the best photos for your jobsite, too. It is always better to include more in depth observations and more pictures. Clear documentation and communication, by preference illustrated with clear pictures (including annotations!) reduces waste, overhead and costly mistakes. This way, there will not be any data left out of the daily report that may have to be guessed at later. Just imagine. You ask one of your subcontractors to replace a door, without any further details. Lots of room for costly mistakes, no? 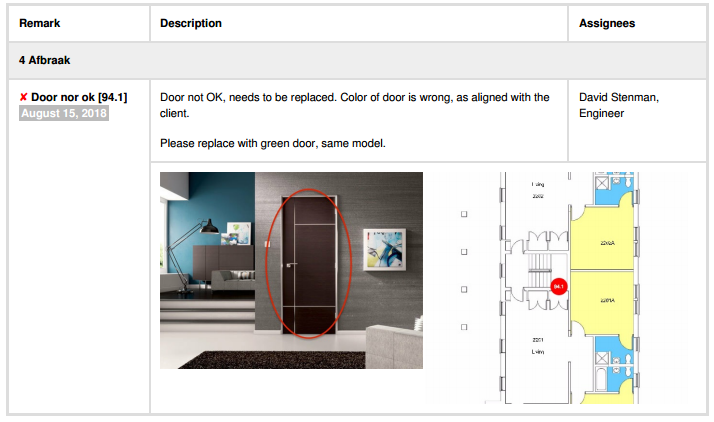 If you include a clear picture of the door, why it needs to be replaced (is it broken? Or is the colour not the right one? Or was there no door needed at this spot? ), and a clear indication on a PDF plan of where exactly the door is located, chances are that soon you’ll have what you need, without any further phone calls, misunderstandings or additional overhead. 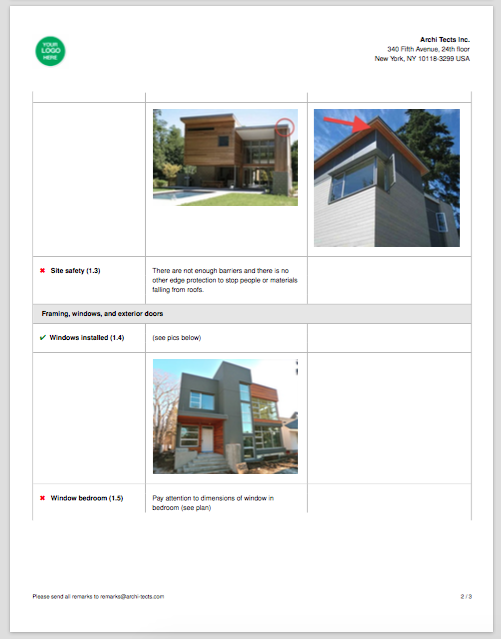 Check out this (fictive) example, which is generated with our field reporting and punch list software ArchiSnapper. Where can I find a good construction daily report template? You can find many free examples online in MS Word, PDF and Excel. That is: if you are willing to work the old way – which means gathering information on site (with pen and paper, with camera, with your smartphone, or emailing pictures to yourself, Dropbox, …), and then in the afternoon (or evening) heading back to the office to put everything in place in a predefined template which you found somewhere on the internet. Isn’t there an easier way to do it? There is, thankfully, a (much!) better way to organise and collate your reports. Due to advances in technology we’ve made it possible for you to complete your daily report via your smartphone or tablet. 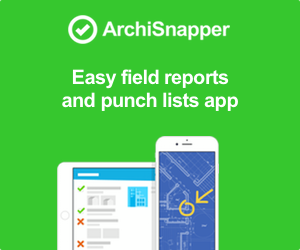 Using our Archisnapper software, you’ve now got the option to build a customized form online, and then access it and fill it in on the jobsite via our easy to use app. There’s sections for everything that we’ve mentioned above – plus you can add in your own fields, and you can attach pictures and diagrams (with annotations if desired) to your heart’s content. 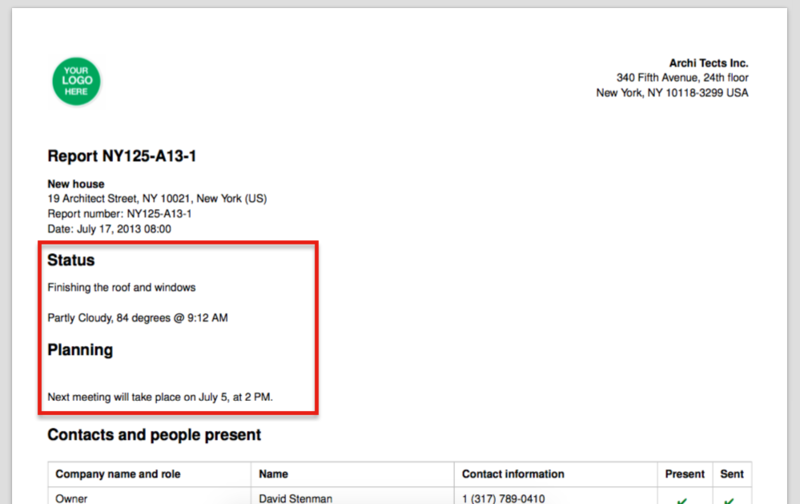 The reports are then automatically sent back to the office, and can be send out to all stakeholders in the list. That’s no more paperwork to look after, and no more messing around with your laptop out on site, or trying to add pictures to your report afterwards – it’s all done within the app. While before most of the daily report work started when you arrived at the office, with ArchiSnapper the report is ready when you arrive at the office from the construction site.